More price cut news from RJC Yachts as Raymond Young sends word of a further $200,000 drop on the 36.58m motor yacht Sigrun. 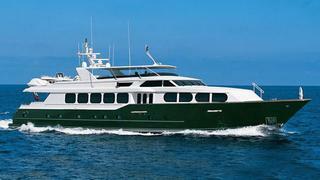 Built by Broward Marine in 2002, she’s one of the finest and most well equipped yachts the yard has ever produced. She can accommodate up to eight guests in an on-deck master suite and three VIP Queen staterooms. She features an enormous flybridge with a custom-made hard top, island bar, full enclosure, custom tender and a variety of water toys. Sigrun is powered by reliable 3412 Caterpillar main engines, and has a 13,000 gallon fuel tank giving her an extended range. She is being offered for the first time by her original owner, and has been immaculately maintained by her original captain. Her hull was repainted in hunter green in 2011, and her white superstructure was repainted in 2010. Available to view in Boca Raton, Florida, Sigrun is down from $5,195,000 to $4,995,000.